Take the step that makes you half a shade braver. but in understanding how deeply afraid of it we are. Honesty allows us to live in not knowing. the secret water, cold and clear." HONESTY is reached through the doorway of grief and loss. Where we cannot go in our mind, our memory, or our body is where we cannot be straight with another, with the world, or with our self. The fear of loss, in one form or another, is the motivator behind all conscious and unconscious dishonesties: all of us are afraid of loss, in all its forms, all of us, at times, are haunted or overwhelmed by the possibility of a disappearance, and all of us therefore, are one short step away from dishonesty. Every human being dwells intimately close to a door of revelation they are afraid to pass through. Honesty lies in understanding our close and necessary relationship with not wanting to hear the truth. The ability to speak the truth is as much the ability to describe what it is like to stand in trepidation at this door, as it is to actually go through it and become that beautifully honest spiritual warrior, equal to all circumstances, we would like to become. Honesty is not the revealing of some foundational truth that gives us power over life or another or even the self, but a robust incarnation into the unknown unfolding vulnerability of existence, where we acknowledge how powerless we feel, how little we actually know, how afraid we are of not knowing and how astonished we are by the generous measure of loss that is conferred upon even the most average life. Honesty is grounded in humility and indeed in humiliation, and in admitting exactly where we are powerless. Honesty is not found in revealing the truth, but in understanding how deeply afraid of it we are. To become honest is in effect to become fully and robustly incarnated into powerlessness. Honesty allows us to live with not knowing. We do not know the full story, we do not know where we are in the story; we do not know who is at fault or who will carry the blame in the end. Honesty is not a weapon to keep loss and heartbreak at bay, honesty is the outer diagnostic of our ability to come to ground in reality, the hardest attainable ground of all, the place where we actually dwell, the living, breathing frontier where there is no realistic choice between gain or loss. FORGIVENESS is a heartache and difficult to achieve because strangely, the act of forgiveness not only refuses to eliminate the original wound, but actually draws us closer to its source. To approach forgiveness is to close in on the nature of the hurt itself, the only remedy being, as we approach its raw center, to reimagine our relation to it. Forgiveness is a skill, a way of preserving clarity, sanity and generosity in an individual life, a beautiful question and a way of shaping the mind to a future we want for ourselves; an admittance that if forgiveness comes through understanding, and if understanding is just a matter of time and application then we might as well begin forgiving right at the beginning of any drama, rather than put ourselves through the full cycle of festering, incapacitation, reluctant healing and eventual blessing. …at the end of life, the wish to be forgiven is ultimately the chief desire of almost every human being. In refusing to wait; in extending forgiveness to others now, we begin the long journey of becoming the person who will be large enough, able enough and generous enough to receive, at our very end, that necessary absolution ourselves. HIDING is an act of freedom from the misunderstanding of others. Hiding is creative, necessary and beautifully subversive of outside interference and control. Hiding leaves life to itself, to become more of itself. Hiding is the radical independence necessary for our emergence. HIDING is a way of staying alive. Hiding is a way of holding ourselves until we are ready to come into the light. Hiding is one of the brilliant and virtuoso practices of almost every part of the natural world: the protective quiet of an icy northern landscape, the held bud of a future summer rose, the snow bound internal pulse of the hibernating bear. Hiding is underestimated. We are hidden by life in our mother's womb until we grow and ready ourselves for our first appearance in the lighted world; to appear too early in that world is to find ourselves with the immediate necessity for outside intensive care. 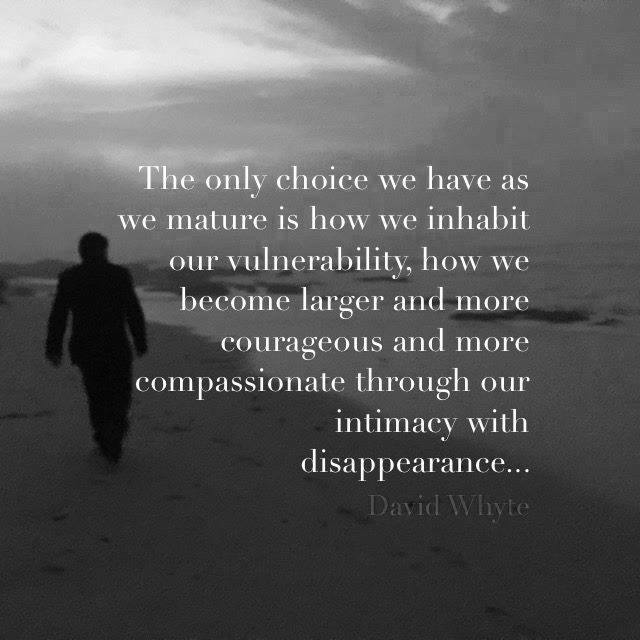 Hiding done properly is the internal faithful promise for a proper future emergence, as embryos, as children or even as emerging adults in retreat from the names that have caught us and imprisoned us, often in ways where we have been too easily seen and too easily named. We live in a time of the dissected soul, the immediate disclosure; our thoughts, imaginings and longings exposed to the light too much, too early and too often, our best qualities squeezed too soon into a world already awash with ideas that oppress our sense of self and our sense of others. Hiding is a bid for independence, from others, from mistaken ideas we have about our selves, from an oppressive and mistaken wish to keep us completely safe, completely ministered to, and therefore completely managed. Hiding is creative, necessary and beautifully subversive of outside interference and control. Hiding leaves life to itself, to become more of itself. Hiding is the radical independence necessary for our emergence into the light of a proper human future.